The heartbreaking story of a Hindu girl and a Muslim boy who fell in love while crossing a mighty river, the war between their parents, and a truce that came too late, as always. The stories of Heer-Ranjha, Laila-Majnu have always been considered the epitome of love. The love stories of our own times are rarely ever given attention, except as newspaper reports of tragic deaths. But the story of Kanchanamala and Moideen, a couple from northern Kerala has now become a part of popular culture with the massive success of RS Vimal’s film ‘Ennu Ninte Moideen’, starring Prithviraj and Parvathy. With the permission of The Open Magazine, The News Minute is reproducing KA Shaji’s story on the couple titled “The Widow of a bachelor” on the love, hope, despair and tragedy in the couple’s lives. (The story was published in 2009 when Kanchanamala was 69 years old). Sixty nine-year-old Kanchana Kottangal has ignored the river for 27 years. It hasn’t been easy. Mukkom, Kanchana’s hometown in the north Kerala district of Kozhikode, thrives on the banks of the river Iruvanji. The wooden canoes that ply the Iruvanji connect Mukkom with the rest of the district, some even prospect the river for gold. But these waters that flow westward to the Arabian Sea remind her of lost love. Society and family are not uncommon villains, but for Kanchana, it was the Iruvanji River that ensured she and the man she loved would never have a happy ending. About 55 years ago, Kanchana and BP Moideen were among the many teenagers from Mukkom who travelled in a canoe across the Iruvanji to catch a bus that would take them to school in Kozhikode, the closest city. She was the daughter of a Hindu landlord, he the son of a prominent Muslim planter. They were childhood friends, who studied in the same school, grew up playing and studying together. The two families went back a long way. And as the two children grew out of school uniforms and joined college, they fell in love against the backdrop of the conspiring Iruvanji. “In the beginning it was just friendship. He used to lend me books, mainly novels and poems. Once he gave me a collection of poems by a Malayalam romantic poet, and I found sentences expressing love and romance were underlined,” says Kanchana. “He simply smiled when I asked about it. But very soon I started getting poetic love letters along with the books.” Kanchana had no cause to question Moideen’s sincerity or how much he cared about her, so it never crossed her mind to turn him down either. “It was about a year later that my mother noticed a letter from Moideen while cleaning my bookshelf. All hell broke loose once both families came to know about the affair,” she says. Despite the long-standing friendship between the two families, in the ultra-conservative Kerala of the 1950s, there was no question of the possibility of an inter-faith marriage. The families broke all links with each other. The life sentences of the two lovers began soon after. Kanchana was forced to discontinue her studies and, she says, put under “house arrest”. Moideen was thrown out of his home for refusing to marry a girl his family chose. Under pressure from community leaders, his father cut him out of his will and denied him a share in the family property, even tried to kill him. “His father shot Moideen using a country gun when he tried to forcibly barge into the house. But Moideen had a miraculous escape even though he sustained multiple serious injuries. On another occasion, his father stabbed him 22 times for giving a critical speech in public but Moideen survived again,’’ says Kanchana. Remorseful after the second attack, his father relented to giving him a share of the family property, but never allowed him to enter the parental home or meet his mother. “Moideen was a multi-faceted personality. Apart from being a known short story writer, he was a footballer, swimmer, political activist and painter,” says Kanchana. But she never saw him do any of those things. Separated and chaperoned all the time, it was impossible for the two to talk, let alone meet without being found out. Soon after their confinement, they worked out a system of communication. They wrote each other letters in an encoded language, and sent them through trusted servants and farm hands. “It was I who developed the language in my free time at home using the Malayalam alphabet. The vocabulary was created by misspelling common words. With the help of supportive servants at home and on the estate, I sent him basic concepts of the code language,” she says. “It was a Herculean task to ensure that a letter would safely reach the other’s hands. For 10 years, they hardly managed to even get a glimpse of each other. “I saw him once while travelling in the village canoe. He spoke a few words to me. (The first time in 10 years),’’ Kanchana says. At one point, they decided to elope. But concern for their families stopped them. “Mine was a joint family with too many members. Elders told me to avoid that path as the infamy would affect the marriage prospects of my unmarried sister. In his case, his father died and it became his responsibility to look after the rest of the family,’’ she says. Eventually, her confinement lasted exactly 25 years, till a time when it became entirely unnecessary to keep one apart from the other—when Moideen died in the Iruvanji. During the monsoon season of 1982, she was 41 and he 44. One rain-drenched evening, Kanchana, like everyone else in Mukkom, heard about the tragic canoe accident in which the craft overturned in the river, and a person who had saved several passengers drowned in the whirls of the river. It took three days to fish out the body and identify it as the remains of Moideen. Kanchana didn’t get to see his body, there was no one to accompany her to his house, and the decomposed body was buried in a hurry. Following his death, she tried to commit suicide six times. After the last attempt, she was admitted to a local hospital, where she again tried to end her life. A fortnight after Moideen’s death, Kanchana had an unexpected visitor: Moideen’s mother. She told Kanchana that if she didn’t wish to marry anyone else then Kanchana should live as her son’s widow. Kanchana moved into Moideen’s house with his mother. 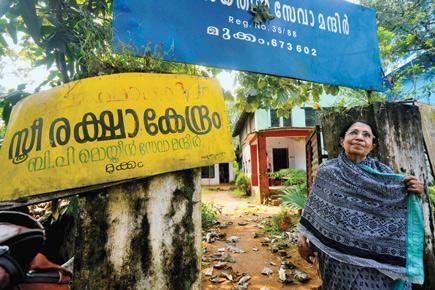 Before her death a few years later, his mother willed all of Moideen’s properties to Kanchana so she could continue some of the social service work Moideen had begun. But it isn’t easy to flee the reminders of the losses in her life. Kanchana’s office is in the village bazaar, a stone’s throw away from the mighty Iruvanji. “In the last 27 years, neither have I used a canoe nor gone to the spot from where Moideen swam across the river to reach the accident spot. I prefer to travel by road,” says Kanchana. This October, months after the monsoon had receded, the Iruvanji still looked ferocious. The operator of a canoe gingerly manoeuvred his tiny craft with four village elders in it. The four old gentlemen were on their way back from the city after submitting a memorandum to the district collector. They demanded that the proposed bridge over the Iruvanji be named BP Moideen, Mukkom’s most illustrious son. The Open Story is here.